Concussion is a brain injury and happens more often than is thought, and much more often than is reported in contact sport. Principal physio, Shaun, is going to explain what it is, what to look for and how to effectively manage a concussion. Firstly, lets clear up this point: Contrary to popular theory, you do not have to lose consciousness to have a concussion – only 10-20% of cases lose consciousness. That is why it is important to know what to look for if a concussion is suspected to ensure serious brain injury doesn’t occur. Consussion is caused by either a direct blow to the head or face, or a blow to the neck or body causing an impulsive force to be transmitted to the head. Consussion is sport usually has fast onset but short lasting effects that resolve quickly. But, in severe cases, the signs and symptoms may build and worsen over the hours after the injury. So how do you manage a suspected concussion? 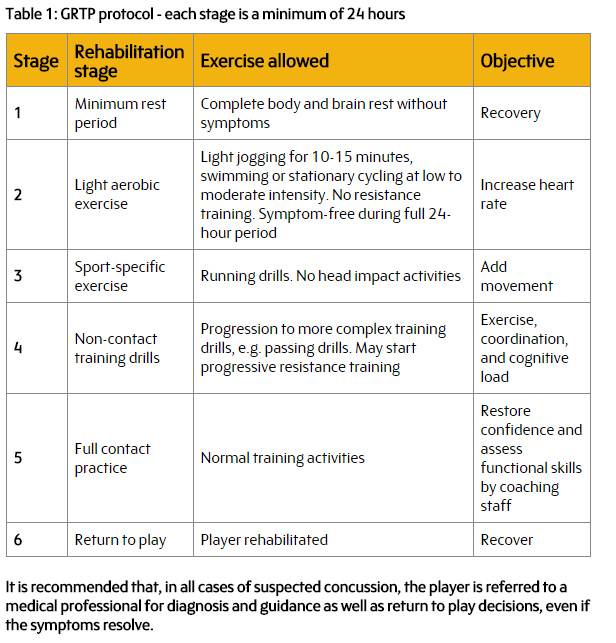 Follow the Recognise and remove 6 R’s of Concussion in sport. Note: If an athlete is unconscious basic first aid principles apply. Protect the players neck and secure and open airway. Call for medical assistance. There are a number of resources available to assist people in recognising and managing concussion. 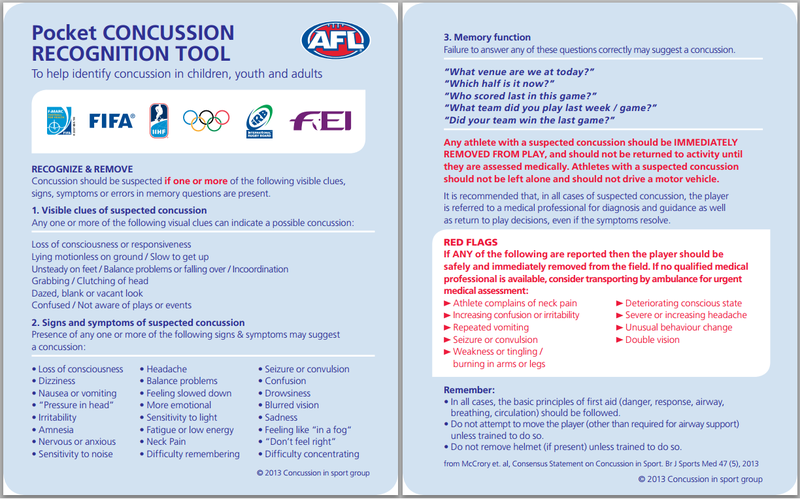 The Pocket Concussion Recognition Tool is a sideline assessment tool that can be used to help non-medical personnel recognise a concussion. If any athlete has a suspected concussion, they must be withdrawn from playing or training immediately. This is non-negotiable. All athletes with concussion or suspected of concussion need urgent medical assessment and should not be allowed to return to play in the same game or training. All athletes who receive a concussion or with a suspected concussion should be seen by a medical professional with experience in managing concussion. If a players condition deteriorates or there is loss of consciousness or seizures, they should be sent to the hospital. Note: Unconscious athletes should only be moved by qualified medical support staff. If there is no one on site qualified then do not move the player and await the arrival of an ambulance. Rest is very important after a concussion because it helps the brain to heal. Everyone responds to concussion differently and even though some recover very fast, others will have symptoms for days or even weeks afterwards. Rest should not involve any physical, visual or mental stimulation – The brain also needs to rest, not just your body so do not challenge it. This means no reading, watching TV, playing video games etc – Rest your brain. Full recovery from the concussion is required before return to play is authorized. This includes being symptom-free. 6. Return to play – This is a really important step to get right. Just like slowly returning to play after a muscle injury, you cannot rush straight back in, not without doing a training first and doing the right progressive rehab exercises. Athletes should not return to play until they have successfully followed the return to play guidelines and have been given clearance by a health professional. For more information on the timing of returning a athlete to play please refer to the Return to Play section of the website. Just remember, all concussions are serious. If there is any doubt, sit them out! For more information, follow this link for a PDF print-out from World Rugby.